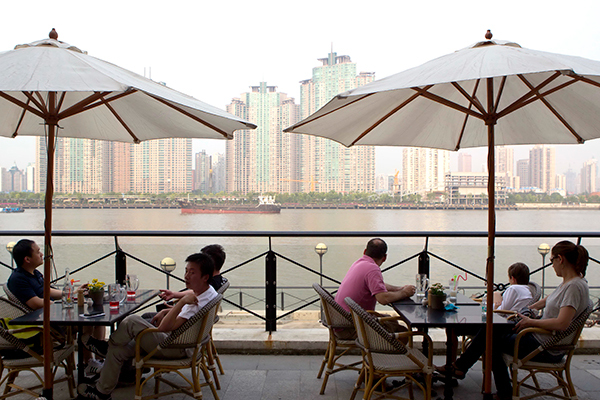 A big trend toward small things is well under way in Shanghai's luxury real estate market. The metropolis' stratospheric housing prices are forcing developers to downsize high-end properties to make them affordable. "Shanghai's luxury real estate market today is replicating the story of Hong Kong," said the Shanghai office of Hong Kong-listed China Overseas Land and Investment Ltd. "Buyers are accepting the idea that luxury homes could go with a floor space of 100 square meters, a frustrating reality that Hong Kong people have long lived with." Sky-high home prices are pressing builders in Shanghai to redefine luxury property by size, where the average price of a 90-square-meter home, if not luxury, has been about 25 times average household income this year. More than two years ago, luxury homes with a floor area ranging from 250 to 400 square meters used to be commonplace for the company in Shanghai. However, with housing fever showing no sign of cooling down over the past two years, the State-owned developer is compelled to control selling prices by trimming the size to 200-210 or 130-140 square meters. As of November, the average price of flats in Shanghai had reached 50,000 yuan ($7,278) per square meter, while houses priced at no more than 100,000 yuan per square meter could hardly be labeled as "luxury". Upgraders who are in a hurry to replace their small apartments with better accommodation have been the mainstay of purchasers. The hard fact is the infinite upside potential in Shanghai's home-buying costs is lowering people's expectations for living space. A batch of luxury flats in downtown Shanghai, 100 square meters in size valued at 10 million yuan each, has proven to be highly sought-after. The company said smaller luxury homes could well be a long-term trend, as Shanghai is poised to emerge as a megacity in the foreseeable future, dwarfing its peers like New York, London and Tokyo, both in terms of the size of city and housing prices. "There is a big chance for overall home prices in Shanghai to surpass those of Hong Kong. So it would be safe to say that house-buying costs in Shanghai will see room to climb," said the builder. Although policymakers in the world's second-largest economy are grappling to cool the red-hot real estate market in first-tier cities, the developer said a flurry of cooling measures points to weeding out the unregulated, highly indebted properties, rather than dealing a blow to normal demand. Such a belief made the company reiterate its confidence in the coastal city's property market. But demand on a nationwide level remains robust, which underlines the price sustainability, in part because buyers are not highly indebted, and tend to invest for the long term and are unlikely to sell houses even if prices drop, four Harvard academics wrote in a working paper last month.